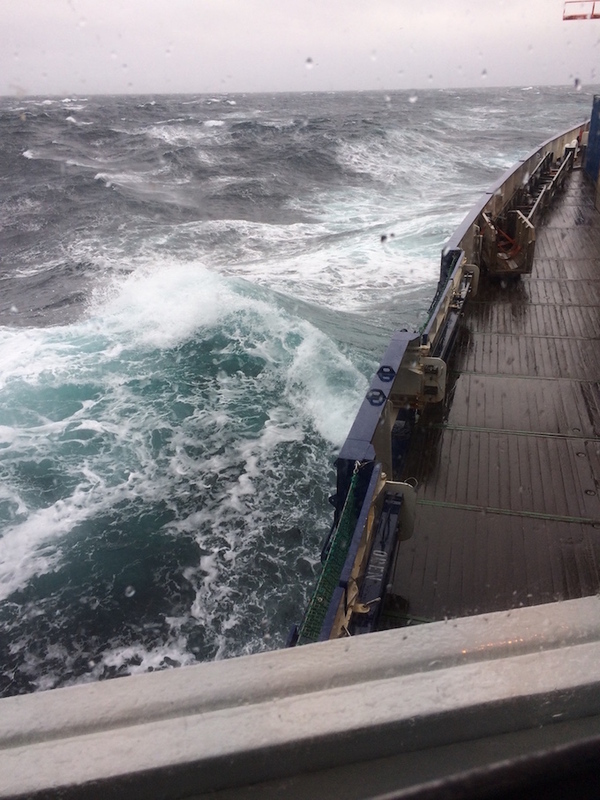 A storm closed the deck of R/V Polarstern on our first day at sea. 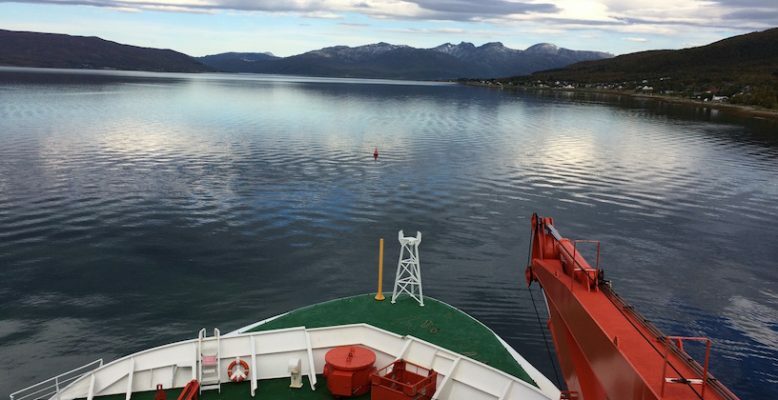 Within hours of leaving port in Tromso, Norway, with its sheltered fjords, mountains, and rocks, we entered the open Barents Sea where winds and waves hit us hard. Water splashed onto the teak deck which turned from a light-yellow brown to a dark-shiny brown or black even. We are lucky, I feel, that winds and waves are heading in the same direction from south to north that we are steaming. This means that the ship is “surfing” the 3-5 m high waves which it otherwise had to plow through. The motion is a smooth pitch with a gentle roll instead the violent, jerky smashing into walls of water that can toss you out of bed. None of that … yet. It is Wednesday morning after our first night at sea. There is no science work scheduled until Friday, so there will be time to adjust, time to find gear, time to unpack, time to set-up, time to get organized, and time to get to know people and life at sea. A first safety briefing was held, a first emergency drill took place, we shared an excellent lunch and dinner, and a first science meeting introduced everyone to overall goals. All these events this first day are social as random people start random conversations with each other. Fun. With 50 scientists and 44 crew it is tough to remember who is who doing what. 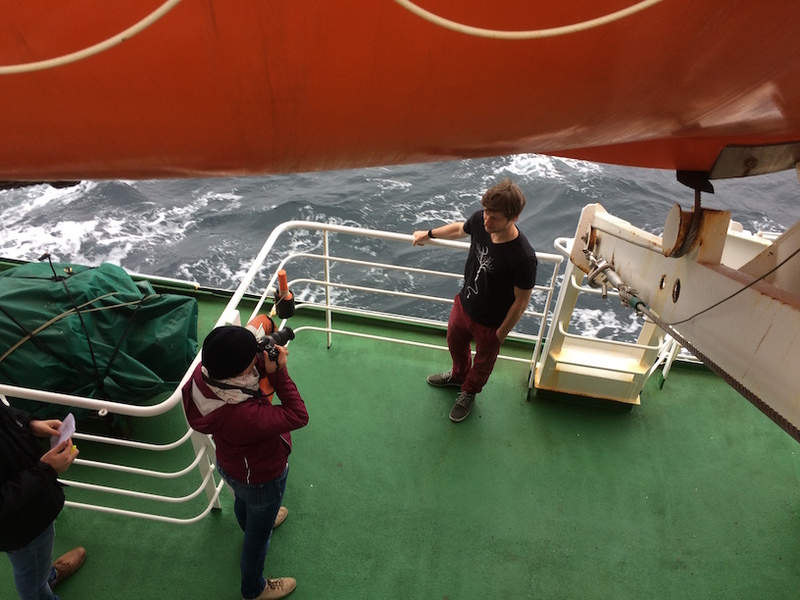 To ease the pain of the memory-challenged, Tilia B. and Ulrike D. took on the task to take a photo of everyone on an upper deck outside that will become a poster of every scientist aboard. The crew has one such poster already, perhaps because they have done this a few times more than us – 109 times to be precise. Our expedition is PS109 or R/V Polarstern expedition number 109. 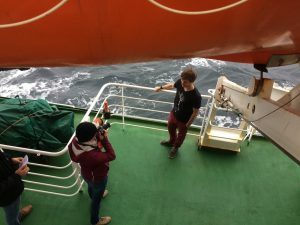 I was on the ship last in June of 2014 on PS85 when we placed seven ocean current measuring devices on the bottom off north-east Greenland to figure out where and how much ocean heat is moved by currents towards floating glaciers that are melted by warm ocean water from below. One of my tasks this year is to get these instruments and their data back. Both water and air are surprising warm at 9 degrees Celsius (C) even during the storm. While this may be cool relative to the 14 C in Bremerhaven (Germany), 12 C in Durham (England), or 22 C in Philadelphia (USA), it is sizzling hot relative to where we are heading where a weather station at Henrik Kroeyers Holme (North Greenland) indicates -1 C, that is, it is already snowing and freezing where we will probably be early next week. And even this is still warm relative to the north-west of Greenland where I maintain a small weather station on Petermann Gletscher reported already -16 C earlier this week (http://ows.udel.edu). Winter has begun in North Greenland.